The Angora is unlike any other rabbit: its long, dense coat is often used as wool, so it requires special care when it comes to grooming and bathing. To keep its hair from becoming dirty and matted, you'll need a proper grooming regimen with regular brushing and combing. However, sometimes this may not be enough, and your rabbit may require a bath. If so, there are ways to ensure a proper cleaning with minimal stress for the rabbit. Avoid bathing in general. It's usually not necessary for Angoras as long as you groom them properly, and it can be a stressful experience for the rabbit. Bathe only a small area of the body that needs it, if possible. Use non-medicated shampoos created for dogs and cats. They should work well for your Angora rabbit. Use a non-soap shampoo that's hypoallergenic and has conditioners. 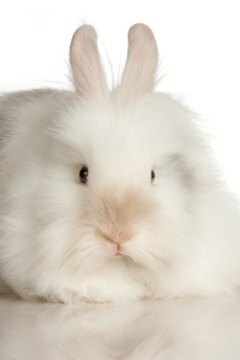 Avoid shampoos made for humans, which will dry out your Angora's coat. Fill the bath with a few inches of warm water to keep your rabbit from becoming cold. Don't overfill the bath; rabbits are not fond of water. Place the rabbit in the bath and gently lather its coat with shampoo. Rinse the rabbit off with a gentle stream of warm water from a shower massager or by using your hands. Blow-dry your rabbit. Set the dryer on the warm setting; never use a high setting. Apply a non-medicated eye ointment on the rabbit's cornea if you must bathe your rabbit's face. Be very careful to keep the shampoo out of its eyes.